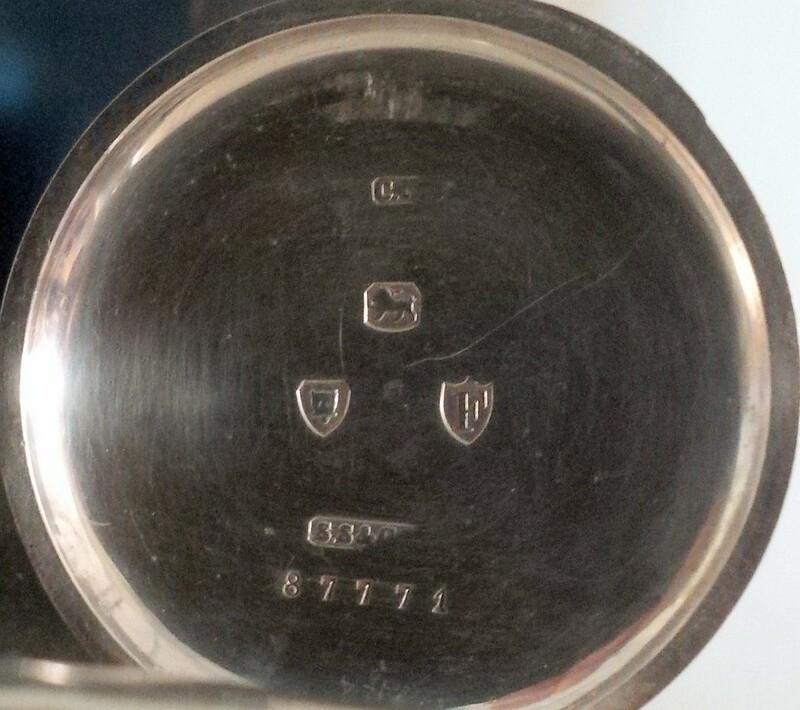 Swiss made watch case with London Assay Office hallmarks for 1881/82. Click image to enlarge. If you are interested in pocket watches you will probably have seen a few Victorian specimens with British hallmarked gold or silver cases and foreign, most often Swiss or American, movements. These stand out as curiosities because the vast majority of foreign watches with gold or silver cases imported during the nineteenth century don't carry British hallmarks. This begs the question of why some do have British hallmarks when the majority don't? The photograph here shows a typical example a Swiss made watch case with London Assay Office hallmarks for 1881/82. The case has Charles Nicolet's sponsor mark "C.N" in cameo within a rectangular surround, and is also stamped with the S. S & Co. trademark of the Swiss watch manufacturer Stauffer, Son & Co. The watch and its case were manufactured in Stauffer's large modern factory in La Chaux-de-Fonds. A letter by J. Lecluse describing the Stauffer factory appeared in the journal of the British Horological Institute in September 1885, shortly after the watch shown here was manufactured, you can read it on may page about Stauffer at Stauffer, Son & Co.
Charles Nicolet first entered his details and an incuse CN punch mark at the London Assay Office on 1 March 1877. The first cameo C.N punch mark was entered on 10 October 1885. The mark in the case pictured appears to have been made by a punch registered on 15 October 1885. The hallmarks are the lion passant standard mark of sterling silver, the leopard's head of the London Assay Office, and the date letter "F" in a shield showing that the watch was hallmarked in 1881 or 1882. Watch cases like this, made by Stauffer in La Chaux-de-Fonds, were shipped over to Stauffer's London office from where they were sent to the London Assay Office at Goldsmiths' Hall to be assayed and hallmarked. The cases were then returned to Switzerland for final finishing and for the watch mechanism to be put in to complete the watch, which was then returned to Britain to be sold. Whether the sponsor's mark was applied in Switzerland at the factory or in London is not clear. It is possible that the registered sponsor's mark punches could have been sent over to Switzerland. This is different from the practice of bare movements being imported and put into British made cases. Right from its foundation in 1874 the Dennison Watch Case Company of Birmingham made cases for imported American and Swiss movements. Many gold cases were manufactured in Britain and fitted with Swiss movements as a result of the imposition of high import duties during the Great War. The cases discussed on this page were manufactured abroad, mainly in Switzerland, and hallmarked in Britain with traditional British hallmarks, including the lion passant on sterling silver and the crown on gold. They were then fitted with foreign movements, either in England or in Switzerland. It was perfectly legal at the time for foreign gold or silver watch cases to be assayed and hallmarked in a British assay office. In fact it was required by British law that all gold and silver items should be hallmarked before being put on sale. But for many years gold and silver watches had been imported without being hallmarked. This was not legal, but the customs authorities didn't realise this, and the people who should have done something about it, the assay offices and in particular the Goldsmiths' Company in London, knew about it but took no action. Rather perversely this situation changed around 1874 when foreign manufacturers started to get some watch cases assayed and hallmarked in British assay offices. English watchmakers then raised strong objections to British hallmarks appearing on the cases of foreign watches, even though this was perfectly legal and should have been done all along. The English watchmakers claimed that it was being done so that British customers would be deceived and think that foreign watches were actually made in England, and therefore pay a higher price for them than they otherwise would. 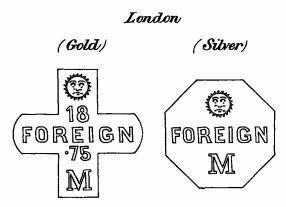 It is possible that the foreign manufacturers wanted the British hallmarks on their watch cases so that the British public could be assured of the fineness of their metal, just as the British law required. This was certainly the argument put forward by Alfred Bedford, managing director of the British branch of the American Watch Company of Waltham. It is also possible that the English watch manufacturers had a point and that foreign watches were being passed off as English by unscrupulous retailers, the British hallmarks, especially the lion passant of sterling silver, being well recognised by members of the public who perhaps did not understand the limits of its power, which was purely to show the fineness of the metal an object was made from and not its place of origin. It is also possible that the English manufacturers, under pressing competition and price pressure from imported watches, saw an opportunity to create some artificial trade barriers, which they almost succeeded in doing. And it is almost certain that all of these factors were involved in what transpired. The 1738 Plate (Offences) Act passed in the reign of George II was an important Act. It pulled together and clarified a lot of the law on hallmarking and although amended several times it remained the legal basis for hallmarking in England until 1975. The Act required that all gold or silver items that were sold, exchanged or exposed to sale in Britain must be of specified legal fineness of 22 carat or 18 carat for gold, and sterling for silver, and must be hallmarked. The Customs Act of 1842 (5 & 6 Vict. c. 47 s. 59) included a provision that made it explicitly illegal to sell imported gold or silver items in the Britain unless they had been assayed at a British office and stamped with the usual British hallmarks. To be hallmarked meant that the imported items would have to meet the British legal standards of fineness. This idea was taken up and amplified by the economist David Ricardo (1772-1823 ) who opposed the protectionist Corn Laws, which restricted imports of wheat and argued for free trade. His ideas strongly influenced Robert Peel, leading to Peel's great 'free-trade' budgets of 1842 and 1845 and, as British Prime Minister, the repeal of the corn laws in 1846, although this was opposed by most members of his own party and resulted in his resignation. The principles of free trade meant reducing tariff barriers and import duties on foreign good entering the country. Perhaps the silversmiths were concerned that a flood of substandard foreign silverware would be allowed into the country as a result, or perhaps they just wanted to make life as difficult as possible for their foreign competitors. One effect of the 1842 act was that it implicitly conferred on importers of gold and silver items the right to enter their mark at an assay office so that they could send items for assay. This was recognised in the "Gold and Silver Wares" Act of 1844 (7 & 8 Vict., c.22) when the term "maker's mark" was changed by section 8 to "private mark", which the Act allowed could be registered by any worker, maker and manufacturer of, or trader or dealer in, gold or silver wares. This term never caught on, for obvious reasons, and the term "Sponsor's mark" rather than "private mark" is now used. This is more accurate as to the role of the mark in hallmarking, being an identifier of the person responsible for submitting an item for hallmarking. 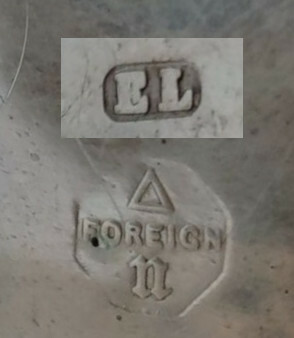 To answer concerns that items of foreign manufacture with British hallmarks could be thought to have been made in the UK, a requirement was introduced for an additional mark, a letter "F" in an oval shield signifying Foreign manufacture, to be stamped alongside the usual hallmarks on all foreign made silver and gold items. This requirement was first introduced in 1867 in the Customs Amendment Act (30 & 31 Vict. c. 82 s. 24). That statute was later repealed by the Customs Consolidation Act, 1876 (39 &40 Vict. c. 36); but the requirement was re-enacted in the same words by the Customs (Tariff) Act 1876 (39 & 40 Vict. c. 35). "What I say is this : that we have never been asked to sue for penalties. No man has ever come and given information, and said, " Here is a foreign watch case which I saw being sold, and I ask you to sue." The thing has never been done. 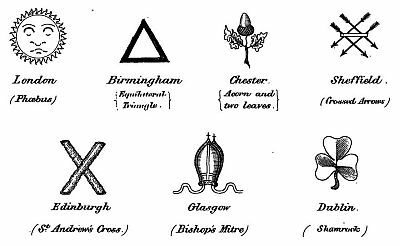 The practice has existed from time immemorial; in point of fact, before the time of [the 1738 Act] 12 Geo. 2 ; and I certainly, in my position as legal adviser of the company, could not advise them to sue under those circumstances; but then I should find it difficult to give a reason for not doing it." These watch cases were being marked with British hallmarks, but they were not marked with the foreign "F" as required by the 1867/1876 law. Mr Prideaux explained that Goldsmiths' Hall had no power of inquiring into the origin of things and that if a registered dealer sent items in with his private registered mark upon it, Goldsmiths' Hall were bound to assay them and mark them without any power of inquiring where they were made. Mr Prideaux also said that if the laws were to be implemented as intended then it was absolutely necessary that the Customs not be allowed to part with imported goods unless they had been hallmarked. Evidence was presented to the committee of the number of watch cases marked at Chester. Before 1876 all were English made, and in 1875 they hall marked 25,778 English made silver watch cases. In 1876 they hall marked 34,846 watch cases, of which 10,224 were foreign made, and in 1877 they hall marked 45,355 watch cases, of which 20,704 were foreign made. 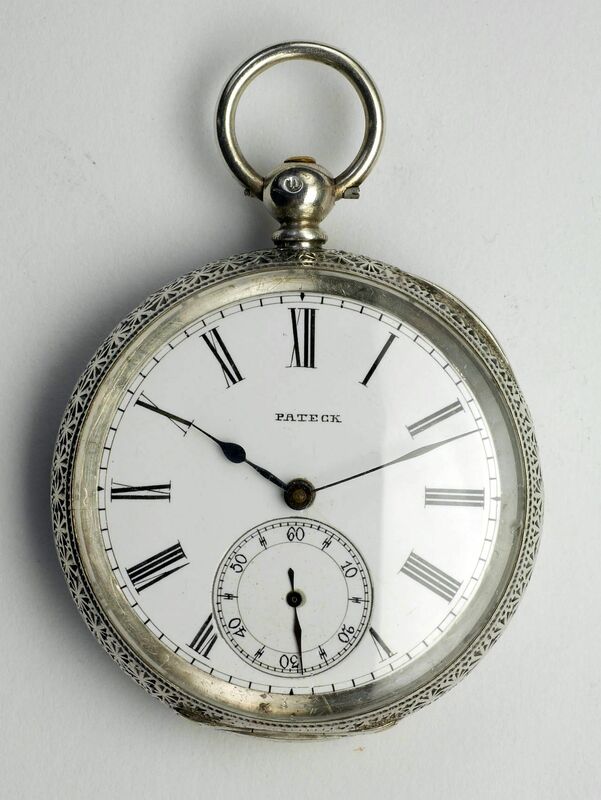 The quantity of English manufactured watch cases marked at Chester over the three years had remained virtually static at 25,778, 24,622 and 24,651 whereas the number of foreign cases had increased markedly. 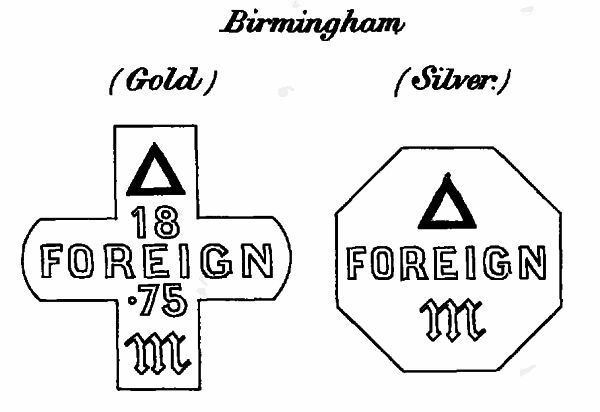 Although it is not mentioned whether these cases were marked with the additional "F" hallmark signifying foreign manufacture, it seems most likely that they were not and that the Chester Assay Office, like the London Assay Office at Goldsmiths' Hall were recording the numbers of cases they thought were of foreign manufacture but were powerless to require them to be declared as such when they were submitted for hallmarking. Who was sending these foreign watchcases for British hallmarking? Watches were being imported from two countries; Switzerland and America. The principal, I believe at the time the only, company importing American watches was the American Watch Company of Waltham, or Waltham for short. The first person to enter a mark for this company was Frederick Francis Seeland, who was the first manager of Waltham in the UK. He left the company in late 1876 to take over as manager at IWC in Schaffhausen. He was succeeded as manager of Waltham UK by Alfred Bedford. Watches were imported by Switzerland by a much larger range of enterprises. These ranged from well established and respectable operations such as of Baume & Co. represented by Arthur Baume and who imported their own watches and Longines watches, and Stauffer & Co. represented by Charles Nicolet who imported watches from their own Swiss factory through to much smaller operations. Notable amongst these latter were one Antoine Castelberg who was not associated with any factory but acted on his own accord, ordering watches from various factories in La Chaux-de-Fonds. The dates of first entry of their marks are shown in the table below. The earliest mark I have identified was registered by Castelberg in August 1875, followed by Seeland in November 1875. This doesn't fit with Mr Prideaux's statement that he first noticed in around 1874 that significant quantities of foreign made watch cases were being submitted for hallmarking and there might well be an earlier registration of an imported or agent that I have not yet identified, although I have been carefully through the register at the London Assay Office. The dates of registration of Seeland and Bedford accord well with the evidence from Chester. Of course the Dennison watch case factory was getting under way at that time which would soon eliminate the need of Waltham for imported watch cases. This list is by no means exhaustive and further research is required. Alfred Bedford had presented a petition to parliament arguing against the draft bill proposed by Sir Henry Jackson and asking for the Select Committee to be set up. He was the only witness to appear before the Select Committee to protest against possibly being denied the right to send cases to have British hallmarks. In his evidence he stated that in 1877 Waltham UK had imported 5,000 cases from the United States and 18,000 from Switzerland, most of which had been hallmarked at Chester. It is interesting to compare the total of these figures, 23,000, with the figure of 20,704 foreign watchcases hallmarked at Chester in 1877. It appears that all of the foreign watchcases marked at Chester could have been submitted by Waltham UK. Although Bedford opposed the draft bill because he wanted to continue to be able to send foreign cases to be hallmarked, he pointed out that the American Watch Co. of Waltham always marked its own name on its watch movements, so there was no question of them being passed off as English manufacture. 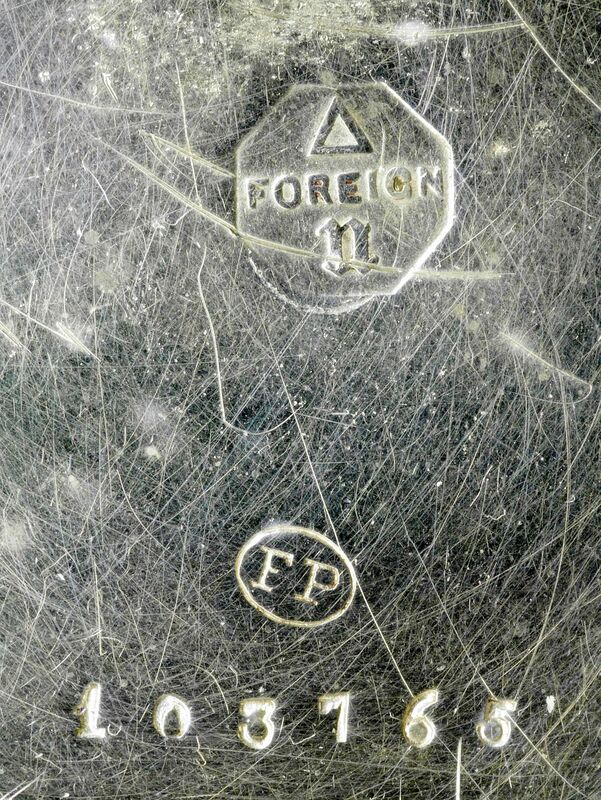 The effect of these new hallmarks, very different from the normal UK marks and with the prominent word "Foreign" in the middle, was to stop immediately foreign manufactured watch cases being sent for British hallmarking, as effectively as if the wording had been "Foreign muck" - which is probably what it was intended to imply! 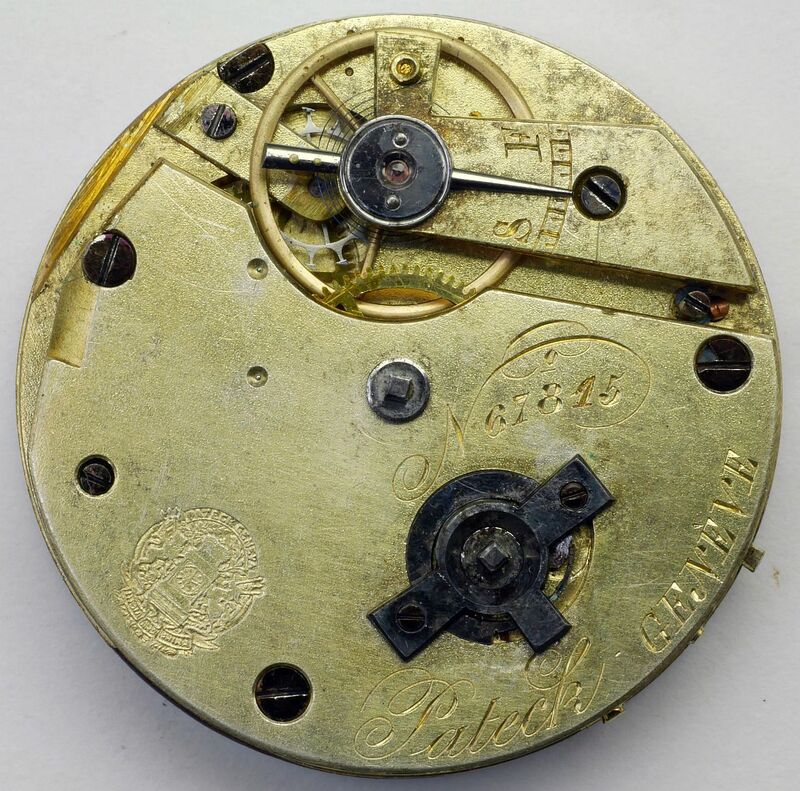 The foreign marks would not have been applied to British made watch cases, so it would have been possible for foreign manufacturers to use genuine English made cases with the usual British marks, but the Act anticipated this and also required a clear statement of where the "works" were made. The upshot of the 1887 Act was that foreign watches no longer received British hallmarks and the English manufacturers were happy. 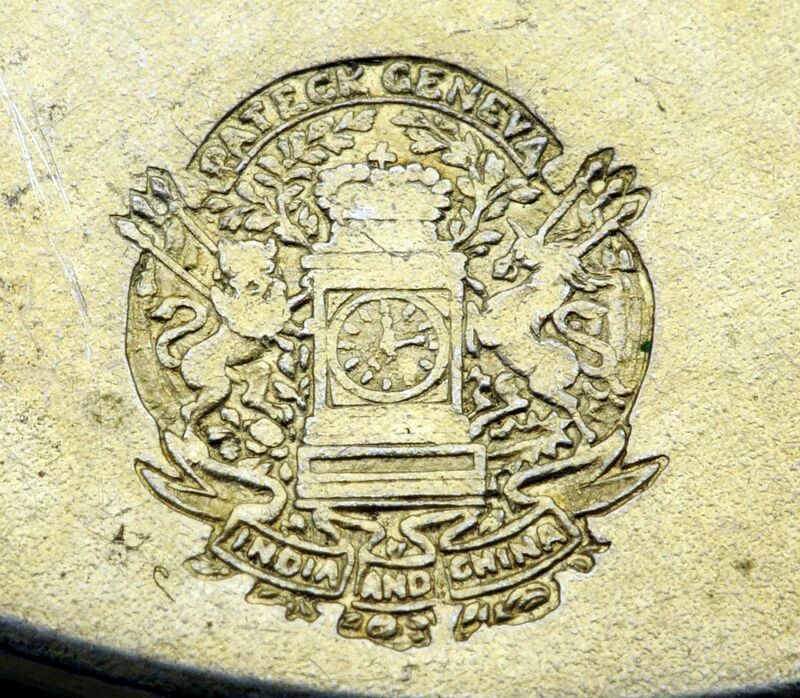 Very few watch cases received the "Foreign" hallmarks. Evidence presented to the House of Commons (discussed in the next section) indicates that three watches were marked between 1902 and 1903 on declaration that they were foreign, and in "Marks on Gold & Silver Plate" by William Redman, 1907, Redman says that the 1887 act was "almost a dead letter" and that he had only seen three watch cases marked as required by the act in the twenty years that it was in force. Whether he was referring to the three cases already mentioned or had actually seen three cases, those three or another three, is unknown. Three watches in two years! This must have caused some puzzlement, and then there was a bombshell when it was revealed that the Customs authorities didn't treat imported watches in gold or silver cases as "plate" and had therefore not been ensuring that they were sent for assay, and that although the Goldsmiths' Company was perfectly well aware of this, as Walter Prideaux had told the parliamentary select committee in 1878, they hadn't challenged it or attempted a prosecution. In 1904 the Board of Customs consulted the law officers of the Crown, who were of the opinion that the cases of watches imported complete should be hallmarked. However, the Board Customs had long treated imported watches as not requiring to be hallmarked and so were reluctant to change their practice without a some more formal decision, so they asked the Goldsmiths' Company to take out a test prosecution. The Company agreed and looked for a likely candidate to prosecute. They didn't have to search far: one William Wyatt had "form" as far as the Company was concerned. In 1897 Wyatt had been found guilty of fraudulently transposing hallmarks (cutting the hallmarks from a legitimate item and soldering them onto another item of substandard fineness) and sentenced to 14 months' imprisonment with hard labour. So, on the 14th day of March 1905, Sir Walter Sherburne Prideaux, Clerk of the Goldsmiths' Company and son of Walter Prideaux, went calling on William Wyatt and purchased four watches, two in silver cases and two in gold cases. None were hallmarked, so the Goldsmiths' Company took out a prosecution under the 1842 act. The judgment by Mr. Justice Channell in the initial trial of Goldsmiths' Company v Wyatt went against the Company on the grounds that watches were not "plate". This judgment was reversed in the Court of Appeal before Lord Justice Collins, Master of the Rolls, and Lords Justice Cozens-Hardy and Farwell in November 1906. Lord Justice Sir George Farwell, in presenting the judgment of the higher Court, identified two different uses of the term "plate" and concluded that watch cases clearly were "plate" within the meaning of section 59 of the 1842 Act. 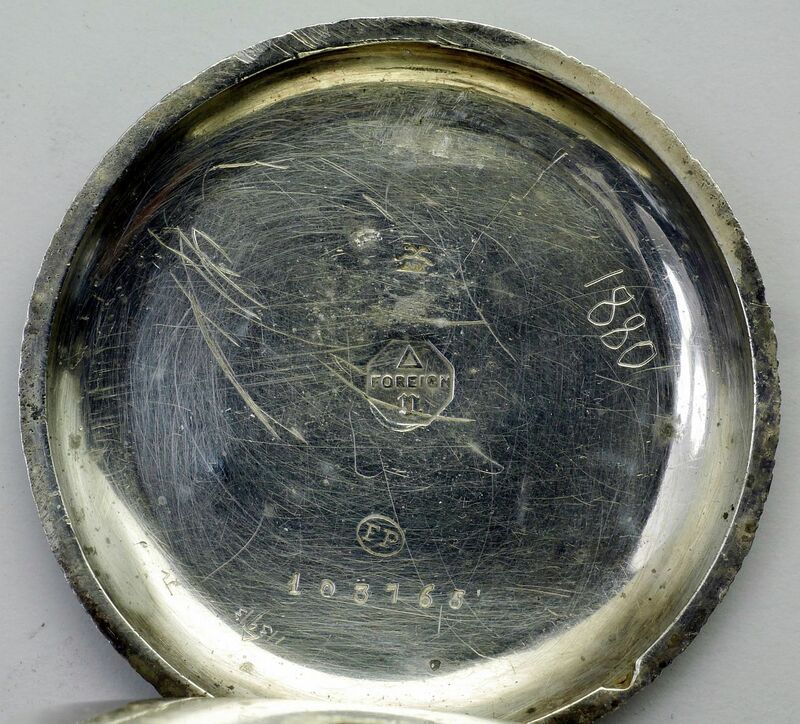 Empty watch cases had in fact been treated as plate by the customs, and the appeal judges found that it could not be contended that the mere insertion of works into a watch case could make the watch case "not plate". He also pointed out that a schedule the customs had relied on when distinguishing between watch cases as "plate" and complete watches as "not plate" was concerned only with taxation, and this schedule did not change the requirement of section 59 of the 1842 Act that required all foreign plate to be hallmarked. In his concluding remarks Lord Justice Farwell addressed the comment that no one would use the term "plate" as including gold and silver watches in common parlance, pointing out that the proper question was not whether gold and silver watches would be described as plate in ordinary language, but whether they were described as such in Acts of Parliament, which the Court found that they clearly were. Lord Justice Farwell concluded that watch cases were "plate" within the meaning of section 59 of the 1842 Act, and therefore should be assayed and marked as required by the law. The case of Goldsmiths v. Wyatt revealed starkly that British law since 1842, and probably since 1738 or even earlier although that question was not addressed, required that gold and silver watch cases should be assayed and hallmarked in a British assay office, and that there were no exceptions for foreign manufactured watch cases, and that this had not been taking place due to a misunderstanding by the Customs authorities with the supine cognisance of Goldsmiths' Hall. The origin of the confusion revolves around the use of the term "plate" in the 1842 Act. Plate is used by the assay offices, and hence in Acts of Parliament about assay and hallmarking, in two distinct ways, (1) in the ordinary way, to mean platters or shallow dishes, and (2) in a particular way as a genus, stemming from the origin of the word in the Spanish "plata" for silver, the major source of work of the assay offices and which became extended over time to include gold items. When used by the assay offices the genus "plate" includes as species vessels, dishes, cups, bowls and every other form of gold or silver ware, even candle sticks. The High Court determined that it was the specialised use of the term that the Act intended to be used. Obviously this specialised use of the term plate includes items that would not ordinarily be called plate by anyone outside the assay office, but that doesn't matter as far as the law is concerned. Unfortunately, in this case, "anyone outside the assay office" included the British customs authorities. They were primarily concerned with levying customs duties, not with hallmarking, and naturally turned to the schedules at the back of the Act containing lists of articles on which duty was to be imposed and the amounts of the duty to be charged. In this schedule "Plate of Gold" and "Plate of Silver" appear in Class VI, and "Watches of Gold or Silver, or other Metal" appear in Class XIX. This difference lead the customs authorities to treat empty gold and silver watch cases as "plate", because they were clearly not watches, but they treated complete watches as "not plate", because watches were in a different class to plate. Such confusion often occurs when the arcane language, often jealously preserved, of one profession is encountered by someone outside that profession.